Artist's impression of the Be star Alpha Arae. If youridea of fun is whirling around on a dizzying carnival ride, astronomers havefound a stellar adventure that would stop you in your tracks. A sizzling-hotstar is spinning around at near break-up velocity, according to a new study. Astronomerswonder if material will be ejected from the star, called Alpha Arae. "Alpha Araeis very close to its breakup velocity, and the matter may freely escape theequatorial regions, 'launched' by the centrifugal force, as if you were on acrazy merry-go-round," lead researcher Philippe Stee of the Observatory of C?ted'Azur in France, told SPACE.com. Locatedabout 300 light-years from Earth, Alpha Arae is the nearest "Bestar"--a class of rapidly rotating stars that are very luminous, massiveand hotter than the Sun.On Aug. 23, 1866, Italian astronomer Father Angelo Secchidiscovered the first Be star, Gamma Cassiopeiae. Since then, the dizzying stars have continued to baffleastronomers. Just acouple 140-year-old puzzlers: How does the ring of gas that surrounds Be starsform? And what keeps the gas disk in motion? The newstudy results, which will be detailed in an upcoming issue of the journal Astronomyand Astrophysics, bring astronomers closer to answering these questions. Keeping gasparticles swirling together in a diskrequires top speed. "Formaterial to be in orbit in a disk, it requires a great deal of angularmomentum," said Ken Gayley, a researcher at the University of Iowa who was not involved in the study.A source of this rotational velocity would be from the central, rotating star. Stee and colleagues examined the Be star and its ring of gas withthe European Southern Observatory's Very Large Telescope atop a mountain in Paranal,Chile. They looked into Alpha Arae's ring with a level of detail equivalent todistinguishing, from Earth, the headlights of a car on the moon, the astronomerssaid. Priorobservations of Alpha Arae indicated the star, although rapidly rotating, wasnot spinning fast enough to supply the required angularmomentum needed to maintain a disk. One limitation had been determining thestar's tilt, or inclination angle, a key component to finding an accuraterotating speed. "It is verydifficult to know if the star is rotating slowly or if it is a fast rotator butseen nearly pole-on," Stee explained. Using their observational data and acomplicated computer model, the team calculated a true rotational velocity. At itsequator, the star is spinning at 1 million mph (470 kilometers persecond)--near its break-up velocity--and speedy enough to supply the neededangular momentum to the disk. This rapidrotation could actually fling off some of the star's matter. Theastronomers also isolated very small regions within the disk and studied eachregion's velocity using the Doppler effect, a compression and expansion ofradiation waves which, with sound, causes a siren to change pitch when anambulance races toward you compared to racing away. "Forinstance if the matter is flowing in your direction the emitted light isshifted to smaller wavelengths [such as blue] whereas if it is flowing away itis shifted to larger wavelengths [such as red]," Stee explained. The velocityof the disk material decreases with the square root of the distance from thestar, they found. Still,astronomers are perplexed as to what physical processes create the disksurrounding Be stars. Many starsand even some planets flaunt a diskof gas. Astronomers have found these disks form as a result of the celestialbody tugging interstellar material into orbit around itself. Depending on thedensity of surrounding matter, the resulting rings of gas can be eitherjam-packed or sparse. For Be stars, the disks are quite dense. 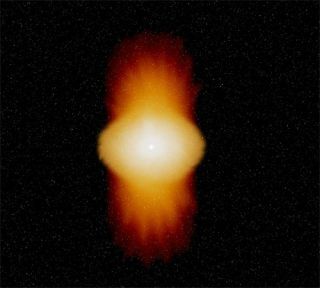 "Such densedisks generally only appear around starsthat are forming from a region that is already a high density gas, so they drawfrom their environment to form disks. But Be stars have cleared out their environmentso it is expected that the disk must come from the star itself, which isunusual," Gayley said. The highspin rate at the equator may cause material to be ejected from the star andinto a swirling disk. "Criticalrotation may be the clue to the 'Be phenomenon' because we were underestimatingthe true stellar rotation measured by the spectroscopy," Stee said. Manyastronomers have supported a theory that Be stars supply disk-making materialbut couldn't prove the spin speed was high enough to fling off that matter. "But this requires that the underlying star be rotating 'critically'"which is the crucial finding in the Stee observation. Thus we are optimisticthat this paper is a first step in a process of confirmation of this overalltheoretical view," Gayley said. The icingon this stellar cake would be to figure out some of the finer details of thisdisk-forming process. "We stilldon't know it the matter around this star has been flinging off by the nearlycritical rotation, or if it will do it again very soon," Stee said. And whetherthe star ejects material in a massive outburst or gradually with persistentloss of matter is still unknown, he said.